It was just two years after the signing of the Declaration of Independence when a group of Presbyterians in Western Pennsylvania decided to build themsleves a new church. This was the original Round Hill Church - a small, log structure built from the trees that were felled to clear the land. The church had no windows and no provisions were made for any creature comforts, but it was filled with love of God and pride is a work well started. The Round Hill Church as it is today. Later this log church was replaced by one built of frame. The site of the frame building was about three hundred feet further up the hill than its predecessor. When this church was destroyed by fire, a third church was built on the exact site in 1884. This is the same one that is in use to this day. The building is of a soft toned brick, much in keeping with the colonial tradition. 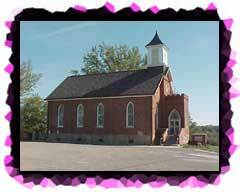 It is a lovely church in a lovely setting atop a hill that affords a picturesque view. Resolved that a committee of six be appointed to obtain said charter. Resolved that Frank Patterson, Esq., Mathew Henderson, A. McKinley, David Nichols, John Guffy and Joseph Peairs constitute said committee. Resolved that the entire business of obtaining said charter be left with the committee. Resolved that the annual meeting of the Board of Directors be held on the last Saturday of October at which time the minutes of the said company shall elect three members for three years, three for two years and three for one year. Resolved that the initiation fee for membership be $1.00. Resolved that Frank Patterson, Esq., and Zerah Hayden be a committee to draft constitution and by-laws to govern said company. Resolved that a commitee of three be appointed to fix the amount to be added to the ground and also the conditions on which it can be obtained for. The chair appointed David Nichols, David Finny and Zerah Hayden. Resolved that William Caldwell, A. McKinley and Joseph Peairs ascertain the cost of different kinds of fences. Resolved that A. McKinley purchase a suitable book for recording the transactions of the Board, and also one for the Treasurer. 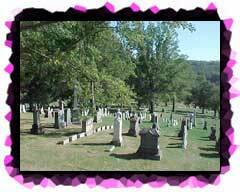 Resolved that Joseph Peairs collect the amount of interest due on the legacies left to the graveyard." Church just inside the entrance. The first mention of any additional land being acquired is noted at the meeting held on August 11, 1883. The minutes record that the Board viewed land to be added to the old church yard, and agreed to pay Mr. Peairs $200.00 and also to give him a lot adjacent to the old family lot at the lower end of the ground. This is almost certain to be the first six acres that were added to the old ground. 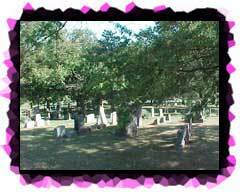 Over the years the cemetery grew gradually, until today those original six acres have increased to approximately thirty. It is of interest to note that when the Round Hill Cemetery Company first drew up it's rules and regulations, it set the prices of plots as follows: Those on "the east side of the driving road" were to be sold for $28.00 and the back lots were to be sold for $25.00 - a rather modest price indeed for six graves! 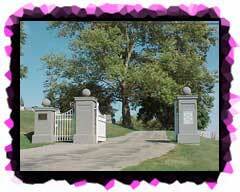 Today the price for each grave is $85.00. "We also wih to acknowledge our indebtedness to Miss Marjorie Scott for contributing information regarding the early history of the church". Additional information can be found in the book, "Between Two Rivers", and other history books written on the area. A list of burials from 1778 up to late 1964 was alphabetically compiled for Round Hill Cemetery. The list was compiled from the records kept in the office of the Round Hill Cemetery and those involved expressed that they were grateful for the assistance of Mr. and Mrs. Earl H. Gamble in the compilation of the burials. A copy of the records made at the time is in the hands of the registrar of the David McKee Chapter, Daughters of the American Colonists, as of this date, January 20, 2000. 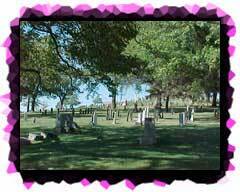 The Round Hill Cemetery office, at the cemetery site, is open daily for those in need of assistance and the burials are still being made today. from behind Round Hill Church. In 1964 it was written that "Within the confines of this country churchyard and cemetery at Round Hill lie the honored from every war in which Americans have been engaged, but of especial historical interest to all of us are the graves of at least thirty-four soldiers who fought for our independence in the Revolutionary War. The following is a list of the thirty-four men whose records have been established:"
The names of these men follow. There are service references that are not listed below. One entrance to Round Hill Farm. 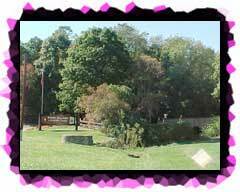 Round Hill Farm has been a picturesque, enjoyable and relaxing place for young and old to visit for many years. Parents bring their tiny youngsters to see the water-fowl and farm animals that are not normally seen in their resident localities. School age children are brought here on field trips. It is especially delightful when one visits at the arrival time of the birth of a new calf. Sometimes you see riders on horseback along the trail, which spans designated paths on both sides of the main road and hill area. The "herb garden" is of interest to many adult visitors. Just walking across the little stone bridge; strolling along the grounds, checking out the growing plants; spotting a deer, small wild animal, or special bird specie (if you're especially lucky); and seeing the bright and shining eyes of laughing youngsters; brings people back again and again. You have really missed something if you haven't visited during different seasons too. Be sure and put it on your "must see list" when in the vicinity in the future. The Round Hill Farm Exhibit is located off Rt. 48 at Round Hill Road just down from the cemetery in Elizabeth Township, PA. 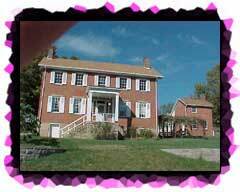 The Peairs/Scott House just down the road from the Round Hill Cemetery is surrounded on three sides by the Round Hill Farm Exhibit site. Once a home of both the Peairs and Scott family members, it has become home to the Allegheny County - Round Hill Park and Farm Exhibit Administration.